In a week that started so promisingly for global markets, the mood quickly turned sour erasing any gains for the year with US bourses suffering their worst day since October. Investors were filled with more than just festive cheer on Monday morning as it appeared that the US and China had finally found some middle ground over their long-running trade dispute. The two global superpowers appeared to broker a 90-day ceasefire during a high stakes G20 summit held in Buenos Aires over the weekend, agreeing to halt additional tariffs and negotiate a deal that worked for both. Asian shares rallied hard on the news, led by China’s Shenzhen benchmark, up 2.6%. Western benchmarks followed the trend, with mining and financial stocks leading the way. However, as Monday wore on, perceptions changed towards the deal as it appeared it would merely pause escalations rather than provide a comprehensive breakthrough. Under scrutiny, it seems that what had been agreed in Argentina was about as woolly as a Christmas jumper; the lack of detail was evident as neither side could even agree on when the truce even started or will start. Donald Trump’s Twitter account did not help things: “…remember, I am a tariff man”, he tweeted. This sent shudders through just about every market, with the tech-heavy NASDAQ affected the most, falling 3.8% on Tuesday. Expectations of a trade war truce had further unwound by Thursday however, as Canadian authorities, at the behest of Washington, arrested Meng Wanzhou, the Chief Financial Officer of Chinese Telecommunications giant Huawei, on allegedly violating US imposed Iran sanctions. All three Wall Street Indices dropped over 2% on the news, only to recover most of the losses later on. Such was the pressure on US markets, the CME Group was forced to intervene with market pauses during the first minutes of trading to prevent severe price movements. The FTSE 100 fared even worse, plummeting over 3%, led lower by falling commodity prices. 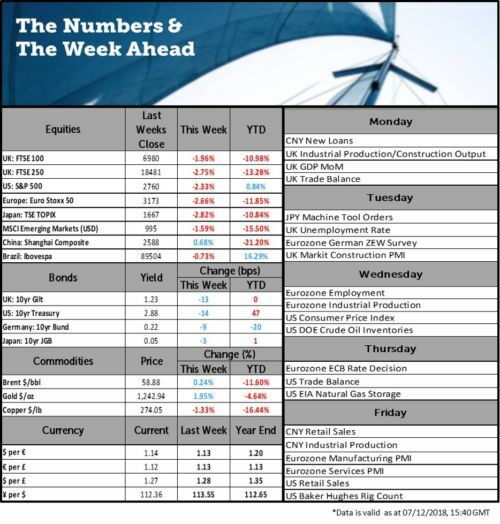 As investors questioned long term economic growth, reflected in global bourses being punished throughout the week, safe haven assets predictably performed well. The spread between the 10-year and its 2-year counterpart shrank to its lowest since the start of the financial crisis, highlighting that investors are favouring gaining protection further down the line and reinforcing perceptions of slower economic growth to come. Some solace was to come at the end of the week as Friday saw some element of poise return. Markets opened up sharply as bargain hunters provided some support coupled with soothing words from the Federal Reserve the night before. Investors also looked forward to important US labour data, released on Friday afternoon. Although weaker than the 198,000 forecasted, the US still added 155,000 to its labour force, showing that whilst not red hot, the US economy continues to grind on. Wage growth was also a little disappointing, coming in at 0.2% v expectations of 0.3% but employment stayed at 3.7%, a multi-decade low.